Tek Eye started as a side hobby and a way of keeping technical notes and jottings online for easy access. Those notes expanded into articles and tutorials as the months rolled by, and the articles have proven popular. I run ads on Tek Eye to cover the hosting costs. 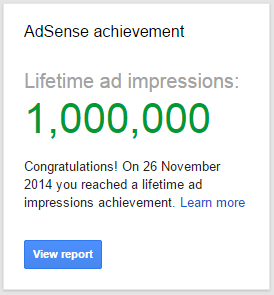 Today I got an email from Google AdSense saying that they had shown their one millionth ad on the Tek Eye website. Apparently, AdSense hands out badges, but they eventually expire. Well why not keep it here for keepsakes. One million ad impressions may sound impressive, but the value of this for Tek Eye is very low, only a few pounds.